Starz, a Lionsgate company, has announced that the new unscripted six-part series “Warriors of Liberty City” will premiere on Sunday, September 16, 2018 at 8:00PM ET/PT. This perceptive documentary series is created by PGA award–winning director and producer Evan Rosenfeld (“Vice World of Sports,” ESPN’s “30 for 30” series “The U” and “Broke”), and it is executive produced by LeBron James and Maverick Carter’s SpringHill Entertainment and Shed Media, a division of Warner Bros. Unscripted & Alternative Television. “Warriors of Liberty City” explores Liberty City, a crime-ridden neighborhood in Miami, Florida, that is arguably the NFL’s largest, most successful football factory. The series follows a season with theLiberty City Warriors, a youth football program founded by an unlikely mentor: hip-hop pioneer Luther Campbell, better known as “Uncle Luke.” Before Liberty City native Barry Jenkins won his historic Oscar® for Moonlight, the city was best known for producing some of the biggest names in football, including Devonta Freeman, Antonio Brown, Duke Johnson and Teddy Bridgewater. 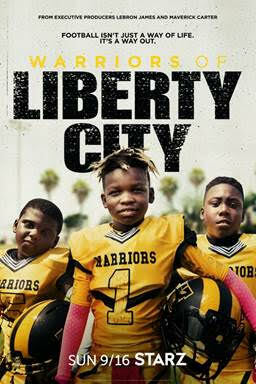 Beyond football, the Liberty City Warriors Optimist Club is a youth organization that sponsors sports teams, dance, cheerleading, tutoring and academic support. Life, like football, is a contact sport, and for the kids and family of Liberty City, being a Warrior holds the key to both. “Warriors of Liberty City” made its world premiere with the first episode at the 2018 SXSW Festival in the Episodic category, making it the first documentary series to be accepted into the category. Rosenfeld created, co-directed and executive produced the six-part documentary series. LeBron James, Maverick Carter and Jamal Henderson for SpringHill Entertainment (STARZ Original Series “Survivor’s Remorse,” “The Wall”); Pam Healey, Dan Peirson and Ted Skillman for Shed Media (“Genius Junior,” “Who Do You Think You Are?”), a division of Warner Bros. Unscripted & Alternative Television; and Luther Campbell also serve as executive producers. Emmy® award-winning documentary filmmaker and screenwriter Andrew Cohn (Night School, Medora) co-directed the documentary series alongside Rosenfeld.